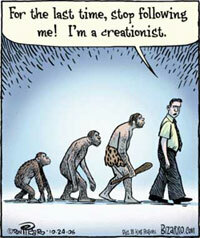 Today I will try to explain why I believe in evolution. You have to realize, though, that saying I believe in evolution is for me like saying I believe in orbits or reproduction. Whether or not I believe it doesn’t make much difference. These are things that I’m pretty sure just are. I should probably begin by saying that I used to be a “Young Earth” creationist. The approach to the Bible that I learned taught me to read the first chapters of Genesis and take them at face value. If they say God made everything in six days, then by golly that’s what he did. God said it; I believe it; that settles it. Considering the genealogies of the chapters which follow, it would then appear that humankind has only been around for a few thousand years. One guy even calculated quite confidently that the earth was created on October 23rd, 4004 BC, and it stuck. So the Earth is only about 6,000 years old. Alright, if that’s what the Bible says, then I’ll believe it. But then I look around and consider a few things. Stars, for example, shine their light down on us from a very, very long distance away. We know how fast light travels, and we use the term “light year” to indicate the distance light travels in a year. We know that many of those stars and galaxies are hundreds of thousands of light years away. Some are millions of light years away (we now know the universe is very, very big). That means their light is only now arriving after traveling for millions of years. Our stars are snapshots of the past–the very distant past. And they prove the world is older than that guy said. That didn’t use to mean much to me. God could create a universe already “in maturity,” right? I mean, Adam wasn’t born a baby, was he? He was created already a grown man. If he were to cut down a tree in the garden, it would probably have rings, right? How old would they be? You see my point. The Genesis creation account seems to indicate that the world was created already old, in a sense. The stars that Adam saw even then were not as old as they looked. I can buy that. But then there’s more. 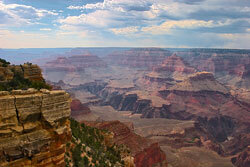 Looking for other evidences of age, I see things like our Grand Canyon, which is a mile deep and up to 18 miles wide. It’s got this river at the bottom of it, and it obviously was cut slowly by that river over a very long time. Estimates for that time period range from 5 million years to 17 million years. Besides things like this, we also have devised dating techniques that measure the steady decay of certain isotopes and other things that, frankly, are out of my pay grade. There’s a bunch more things like this, but you get the picture. Appearances can be deceiving, but if our world is only a few thousand years old, then this is starting to look like a really massive trick. Besides this, we keep digging up bones which paint a picture of a gradual development of the many species of living things around us (including our own species). 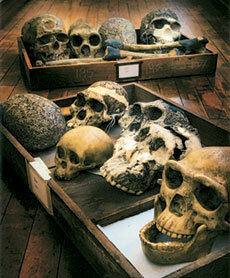 Judging from their depth in the ground, many of these species appear to have predated us humans by quite a bit. The point is, however, that every branch of science we have indicates the earth is billions of years old, and that the human race developed from more primitive species over millions of years. That’s not what the Bible says. I know that. And I could go along with the “created in maturity” concept up until a certain point. I could believe that the world just looks older than it is because God made it to look older than it really is. Much, much older. But if that’s the case, then people should be forgiven for studying the Earth and the cosmos and deciding that they are as old as they seem. They should be forgiven for seeing evidences of gradual development of all living things, including ourselves (What the heck is an appendix for, anyway? Or a tailbone?). But they are not forgiven, are they? At times, in fact, they are angrily chastised for not believing the clear Word of God in these matters. They are shamed and excluded from our schools and churches because they contradict the biblical testimony, choosing instead to cling to their ungodly scientific beliefs. We don’t want them poisoning our children with their spurious logic and their anti-Christian worldviews. I’m with those guys at this point. I think you can be quite faithful to the Bible and yet not use it as a science textbook. Some people in the medieval times tried to do that when someone suggested the earth revolves around the sun, rather than the other way around. They tried to do it when someone suggested the earth is flat and stationary. Both times they were wrong, and both times they were certain they were being faithful to the text. But they weren’t. They were treating the Bible like it’s a different kind of book than it really is. N.T. Wright said some good stuff about that once. Those are good questions. I’m still working on that. Anybody got any good ideas about that? I’ve got more to say, so keep checking back. As I often do with Scot McKnight’s blog posts, I will be closely following one of his current threads pertaining to evolution and its relationship to the Christian faith. This question is very close to my heart at the moment, as I have run up against it a number of times over the last few years. Personally, I have become convinced that the cosmos is as old as our scientists tell us it is. And I see consistently logical reasons to believe what paleontologists and geologists and astronomers have been telling us about the age of the earth and about the gradual development of our species over hundreds of thousands of years. But as a Bible-believing Christian, I have some wrestling to do with the creation account of Genesis 1-3 (really even through chapter 11). How can I decide that these chapters are not to be taken as historical (even if some of the biblical writers may have thought it was, given their historical context) and yet accept Paul’s discussion in Romans 5 of the fall of Adam and our fate as his descendants? How would it affect my understanding of the accomplishment of the Second Adam, Christ, on my behalf? I have plenty to write about this, but right now I’ve got to go corral a classroom full of teenagers (most of whom have criminal records), so maybe watch this space and pitch in your thoughts when you have time. You are currently browsing the Check Back Later blog archives for March, 2010.